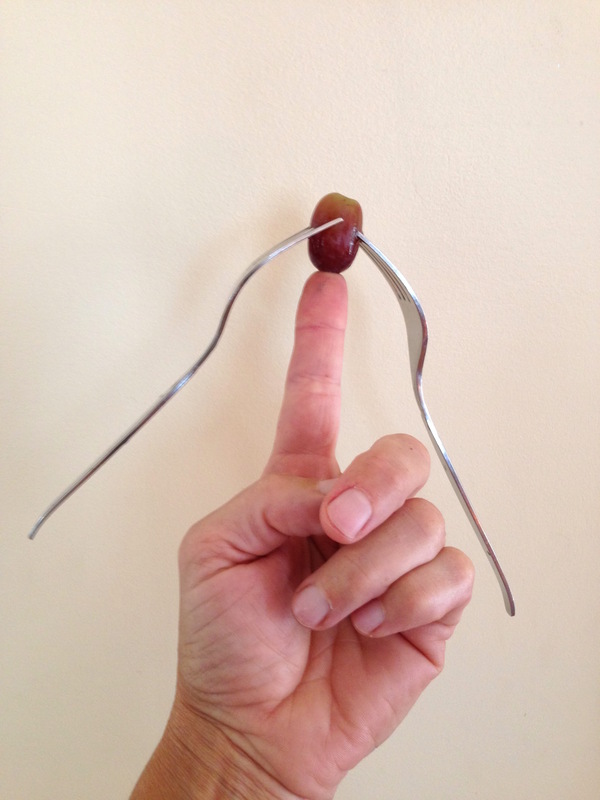 Make a toothpick or grape balance on your finger or other object, by adding weight under it, which lowers the centre of mass to make it more stable. 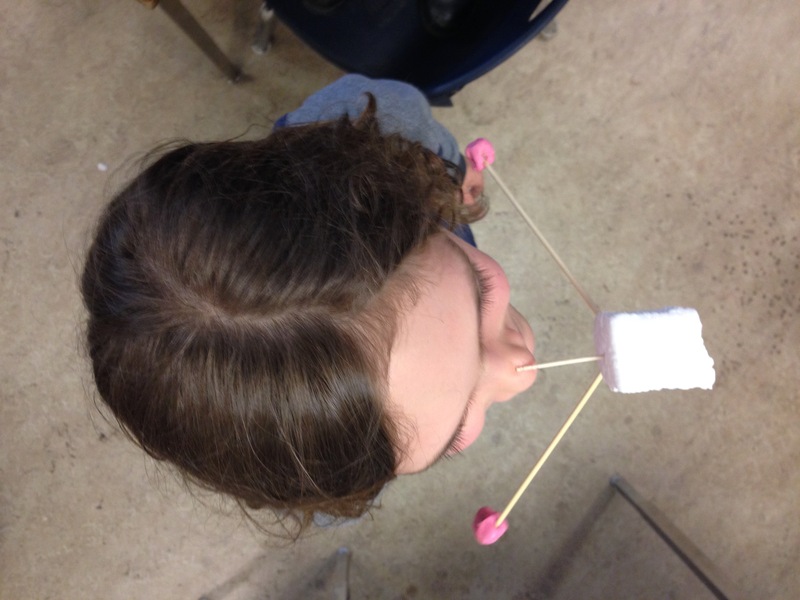 For older students, hand out the materials and challenge them to balance the toothpick on their finger. Show them that it is impossible with just a toothpick, but tell them that they have other materials to add to the toothpick to help them. Give them time to try. 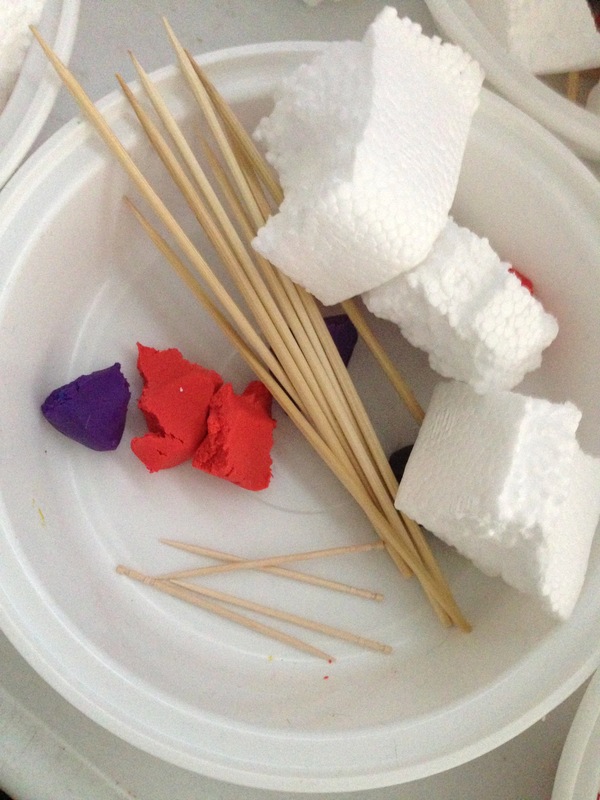 If necessary, give them clues that there needs to be most of the mass of their sculpture under the point of the toothpick, and then that the skewers can help to add the mass of the clay low down. Encourage students to borrow each other's ideas, and that no idea is a bad idea. Encourage students to experiment with various configurations of the materials and see how their new models balance, or not (e.g. what happens if you remove one skewer, what happens if you change the position of the skewers, does it work without the clay at the end of the skewers?...) 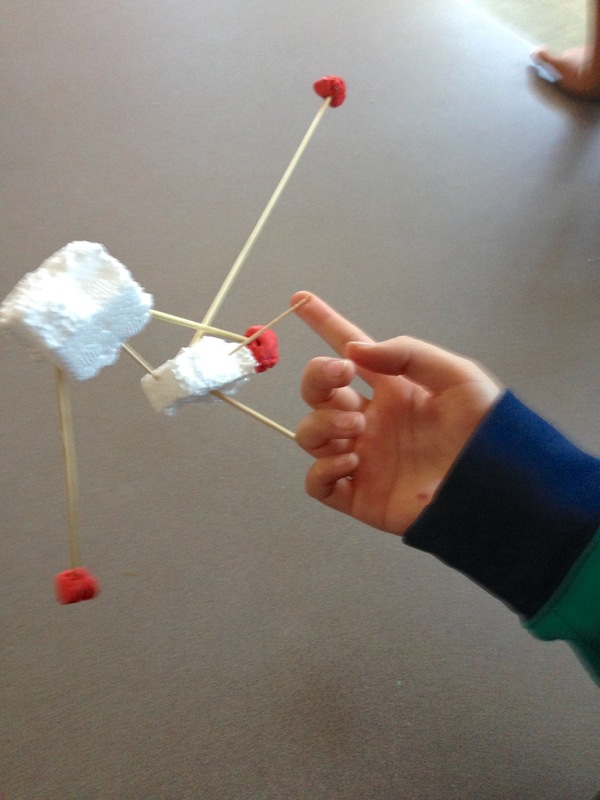 Tell them to try their sculptures on other things in the classroom. 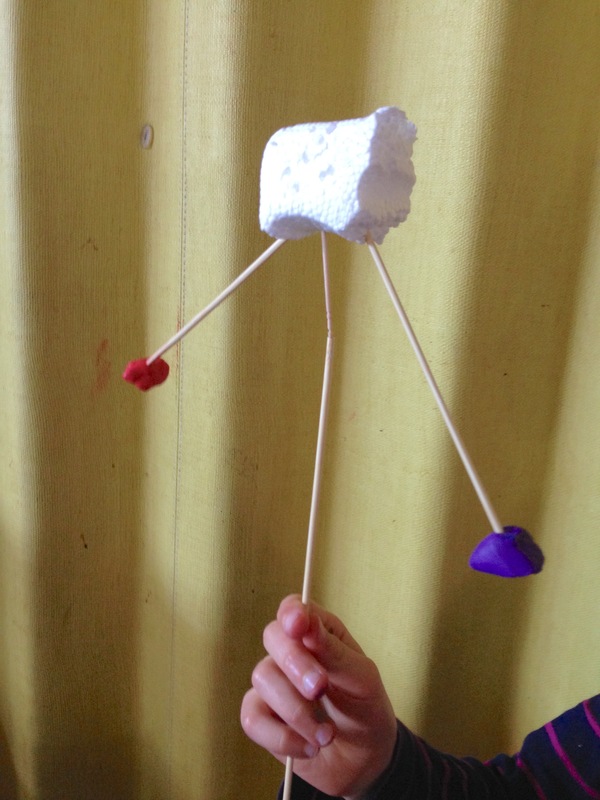 For younger students show them how to make a simple sculpture: push the toothpick into the styrofoam, then add two skewers pointing down and with clay balls on the ends. Ask them to try, and to modify the sculpture if they like. 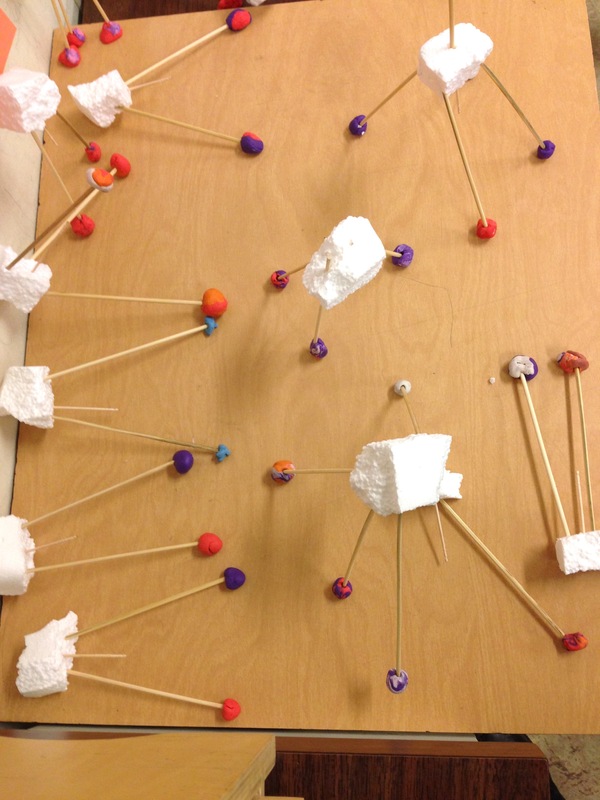 Encourage students to balance their sculpture on other things in the classroom. If pushed to one side, the sculpture can right itself. The sculpture can be rocked back and forth. Try and balance the small end of a grape on your finger. It's pretty much impossible. Add some mass below the grape, using forks, or other heavy objects, stuck into the grape at an angle. 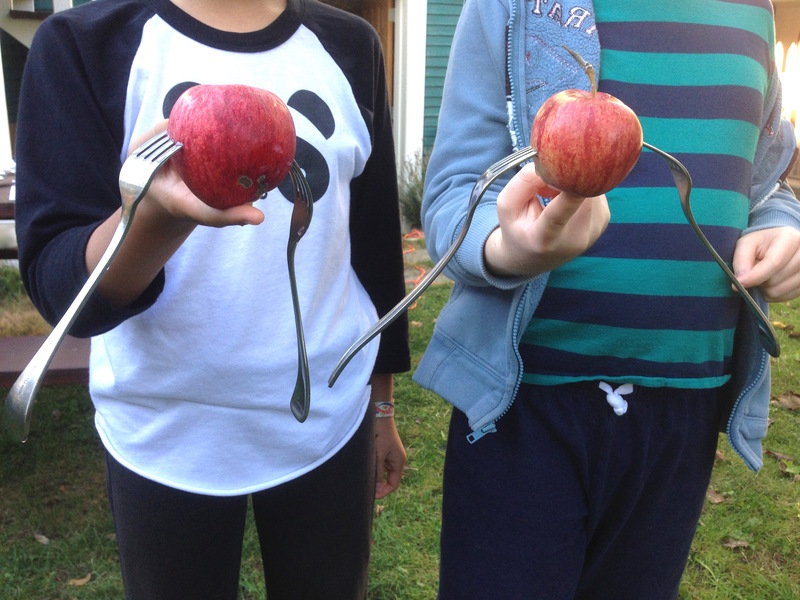 If the forks are heavy enough an apple will work too. A banana with a curve can be balanced on your finger if it curves downwards, as the curve puts some mass below the balance point, making it more stable. The sculpture balances because the average position of all the mass ("the centre of mass") is underneath the balance point (the point of the toothpick). When gravity exerts a force on this centre of mass, it is pulling underneath the point of the toothpick (not above or to one side of it), therefore the toothpick is stable. If the sculpture is tipped to one side, gravity pulls the weights back down to the lowest position, bringing the centre of mass below the toothpick once again. As long as the centre of gravity is below the balance point, any sculpture is stable. Engineers try to design a sports car's centre of gravity as low as possible to make the car handle better. When high jumpers perform a "Fosbury Flop", they bend their body in such a way that it is possible for the jumper to clear the bar while his or her centre of mass does not. When balancing on a beam, we stretch out our arms and move them around, to keep our centre of mass over our feet - not as stable as having the centre of mass below our feet, but better than having our arms by our side. Tightrope walkers have a long pole with weights on the end, which lowers their centre of mass, making them more stable. Astronomical objects in motion are balanced around a centre of mass, forming stable coupled orbits (until a collision or other event moving one of them will make them realign around a new centre of mass).